Click here for the full set of pictures and videos! 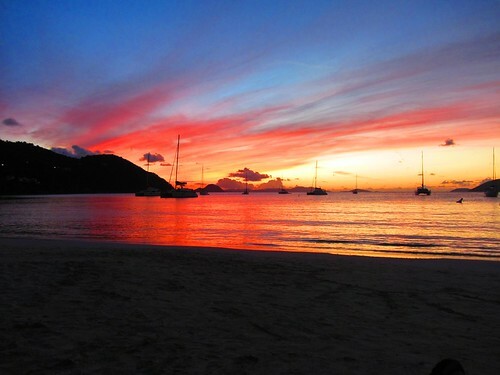 We flew on a 5:00 AM flight from Boston to St. Thomas then took a ferry from St. Thomas to Tortola. 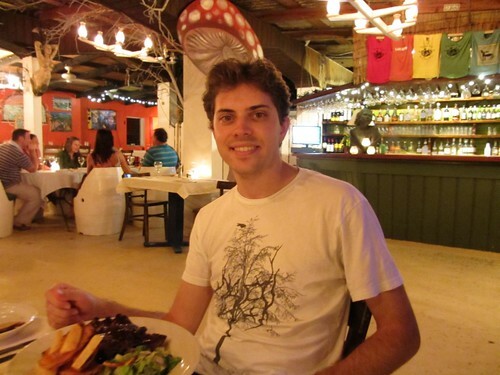 While in St. Thomas, we grabbed lunch at a nice place called Gladys' Cafe before boarding the ferry to Tortola. We had hoped to get to our boat in time to do the briefing in the evening, but the ferry took much longer than expected: it left late and the line to get through BVI customs went really slowly. In the future, we'll be sure to sit near the exit to the ferry so we can get at the head of that line! I think we arrived around 6:30 PM, just as it was getting dark. Our boat was named Moon Wind, which seemed appropriate since there would be a full moon near the start of our trip. The provisioning (groceries) were to be delivered around 9:00 PM, so we went to grab a quick bite. The places on the dock were extremely overpriced, but we got a tip from a local fellow about a cheaper place that was about a mile walk away. Unfortunately, that ended up being almost as expensive! After the chart briefing and the boat briefing, we headed out! We managed to motor out of our slip without any problems and made our way toward the Sir Frances Drake channel. Since this was the first leg of our trip and we got a fairly late start due to the briefings (about 1:30 PM), we decided to make it an easy day and head for Peter Island, which was only about an hour away. The wind and weather was perfect, and Moon Wind sailed quite nicely, so we made great time. 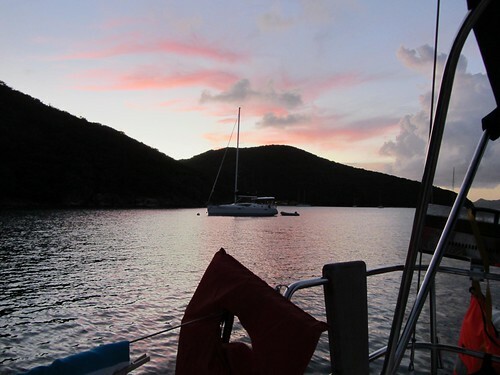 When we arrived at Great Harbor, Peter Island, we did a bit of snorkeling and just relaxed for a bit. 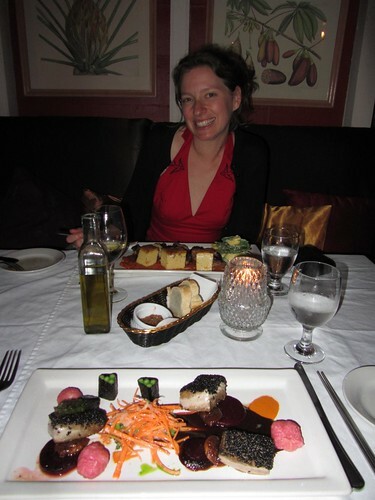 Then we headed over to a little restaurant on the island that was quite tasty. After having some blueberry pancakes for breakfast (cooked by yours truly), we headed on our way. Again, the wind was blowing pretty strong and we cruised along nicely. Here's a video of us under-way toward our next destination, Salt Island. We hit a top speed of 6.9 knots on this leg! We arrived at Lee Bay, Salt Island, where we snorkeled on the wreck of the RMS Rhone, a mail ship that sunk during a storm in 1867. The stern of the wreck is shallow enough that you can see it quite clearly, but the bow is in much deeper water. The day we visited was particularly clear, so we got a good view! After having some lunch, we made our way to our overnight anchorage, Manchioneel Bay in Cooper Island. 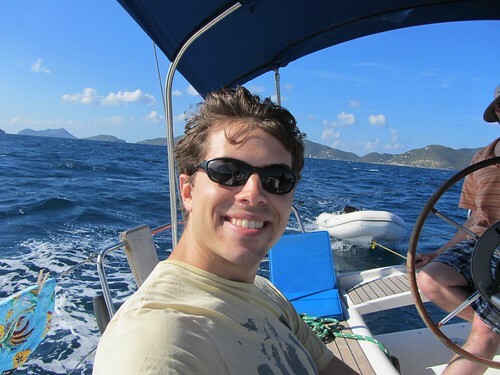 This was another nice anchorage, that was pretty well protected. 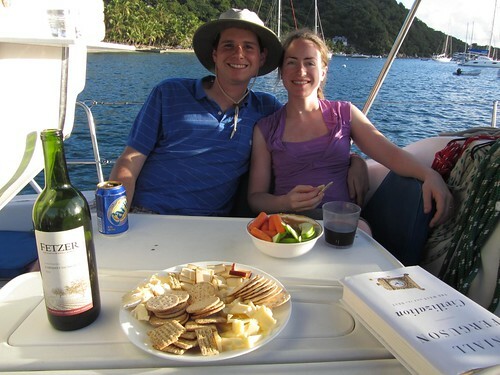 We snorkeled for a bit and had some wine and cheese as a snack before dinner. For dinner, we headed over to a restaurant on the island, which was also pretty good. Most of the restaurants had 2-for-1 deals on certain cocktails from 5:00-6:00, so we made a habit of heading in before 6:00 to take advantage of that. Painkillers and rum punch are two popular drinks in the area. 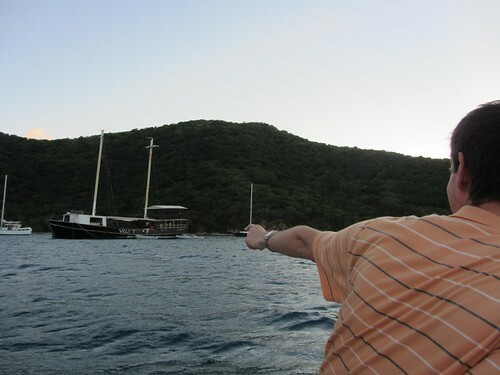 On the fourth day, we decided to head towards The Baths at Virgin Gorda first, where we would stop for lunch. This was listed in the guide as a must-see location, with some really cool caves to be explored. The book also had conflicting advice: don't forget your camera and don't bring anything you don't want to get wet! So I decided to play it safe and leave my camera in the boat. However, an image search yields some nice pictures to give you an idea of what it looked like. It was quite beautiful with the light streaming in from above, and the caves partly filled with water. After making our way through the caves of The Baths, we arrived at Devil's Bay, a beautiful snorkeling spot with tons of colorful fish. Kellian had been a bit nervous about snorkeling up until now, but this is where she really got the hang of it! It is no surprise, since there was so much cool stuff to see. By the time we were done, it was getting a bit late to get to our next anchorage, so we had to make good time. Fortunately, the harbor where we were headed, Trellis Bay on Beef Island, had plenty of mooring balls left when we got there. In the middle of Trellis Bay is a small island named Bellamy Cay, which has a great little restaurant named The Last Resort. I had some ribs that were amazing, and Kellian had a vegetarian pizza that was also quite good. Probably our best meal of the whole trip! In the morning we purchased some ice, sunscreen, and a few other things from a local shop in Trellis Bay. 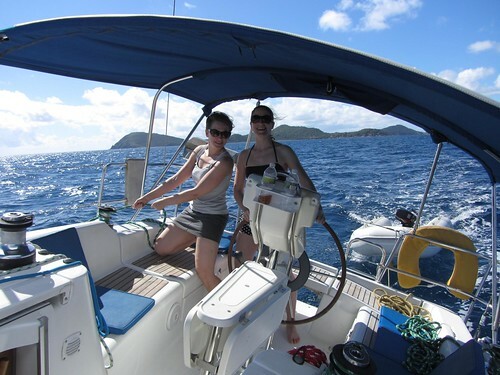 Next, we continued our path along the northern side of Tortola, motoring through the narrow Camanoe Passage before putting the sails up and heading west. We were sailing dead downwind, but decided to sail on a broad reach rather than on a dead run, since it gets a bit dull and hot running with the wind. Also, this course took us further from land, where the wind was more favorable. Eventually we made it to Cane Garden Bay, Tortola, a nicely protected harbor with a beautiful beach that is nestled in the mountains. Due to its proximity to Road Town, it was a bit touristy for our taste. The beach had at least 5 or 6 restaurants that seemed to cater to the cruise ship crowd. Still, the scene was very picturesque! We arrived around lunchtime, and had plenty of time to explore and relax. 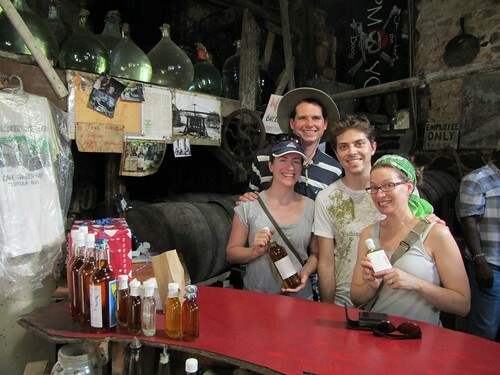 After lunch, we went to the Callwood Rum Distillery, which has been operating continuously for something like 200 years. They had a rum tasting for $1 per person, and had four different rums you could taste. It was interesting tasting the differences: one was aged five years and had a pretty harsh taste, the one aged ten years was quite a bit mellower, one was filtered and had almost no flavor, and the last one had been sweetened with cane sugar. Having a sweet tooth, Kellian and I liked the last one and ended up buying a bottle to remind us of our trip when we got home (and drown our sorrows when it snows!). 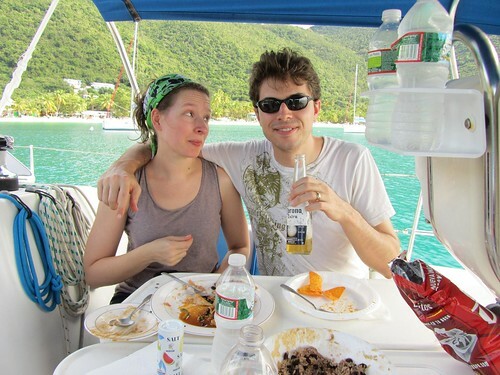 We returned back to our boat and decided to swim a bit, but the snorkeling was a bit lackluster compared to what we had seen the last few days, so Katie suggested that we take the dinghy around to Brewers Bay, where it was supposed to be much better. So we hopped into the dinghy without giving it a second thought and off we went. Little did we realize, but it was over a mile to Brewers Bay! That's quite a trip in a small dinghy. We did eventually make it, but Greg, Katie, and Kellian were pretty nervous being so far away from the boat with only a dinghy, so we headed back right away. We definitely should have checked the charts before heading out! 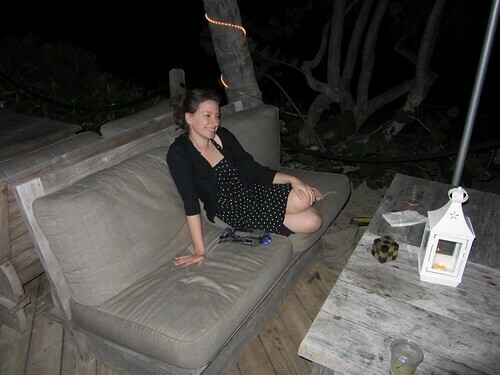 After our adventure, we relaxed for a bit and then headed over to the beach to watch the sunset and sip piña coladas. It was pretty stunning! The whole time, pelicans were swooping in to catch these little silver fish that were all over the place. We grabbed dinner at one of the beach restaurants before heading back to the boat. We started the day off by heading over to Diamond Cay in Jost Van Dyke to do some snorkeling. At the chart briefing, we heard that there were lots of sea turtles around this area, so we decided to check it out. The snorkeling here was indeed incredible! Kellian and I spotted three sea turtles, a sting ray, four squid, and two huge fish that were probably a good 3 feet long. This area also had some nicely developed reefs with all different types of coral and tons of colorful fish. Definitely worth checking out! It would have been nice to spend a night here and check out some of the other areas of Jost Van Dyke, but our trip was drawing to a close and we needed to make our way back closer to Road Town. 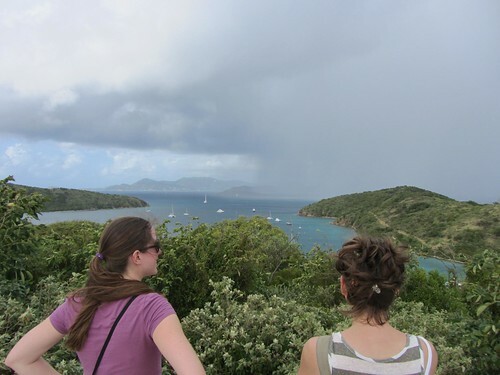 We decided to make our last stop Norman Island, which is only a few hours from Road Town. 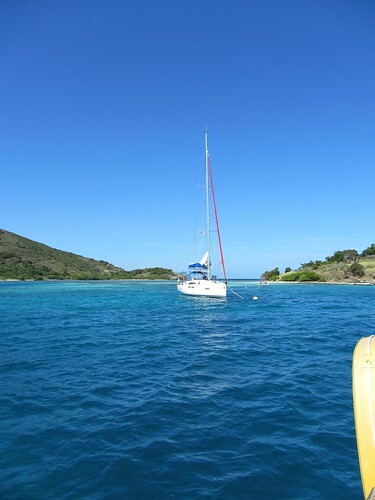 Norman Island was a solid 14 nautical miles from Jost Van Dyke, however, so we had a long sail ahead of us! It was a tricky sail, the winds were quite strong, and we had to make our way through the fairly narrow Thatch Island Cut. Less adventurous souls would have motored through here, but we decided to try sailing through, and it was intense! The wind was shifty due to the land nearby, so we had to be careful not to let an errant gust knock us over. Our top speed was 7.0 knots, which is very fast for a sailboat of this type! After about six tacks, we were back in the Sir Frances Drake channel and headed for Norman Island. The wind continued to blow quite hard, so we made pretty good time. I think it ended up taking us about three and a half hours, which was our longest leg of the trip. 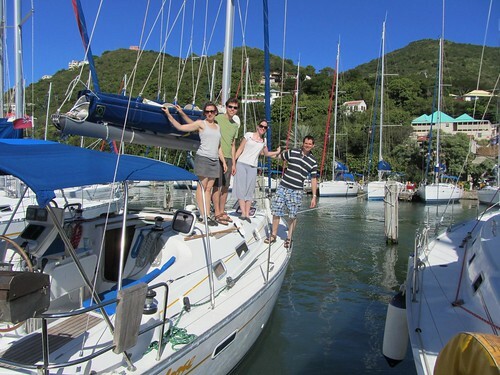 We made our way for The Bight in Norman Island, a nicely protected harbor with tons of mooring balls. I should say that it is nicely protected from the seas, but the wind howled through like crazy! Something about the shape of the hills caused the wind to funnel through quite strongly. We went for drinks at the infamous Willy T, a floating bar and restaurant that is known for being pretty raucous. We were there early, so things were calm, but the party went late into the night! The following day, we planned to head back to Road Town, but we had plenty to do before then. The day started with a hike up Norman Island. We found a nice little path that led nearly to the top of the island, which was pretty high. From here, we got some great views of the other anchorages of Norman Island. We could see that the weather was rainy in the distance, but it mainly passed us with only a few sprinkles. We had been quite lucky with the weather! In our explorations, the skeleton of a windsock led us to discover a helicopter landing pad! It was pretty overgrown, so probably no longer in use, but still a neat discovery. After we were done exploring, we made our way back to the boat and took the boat over to The Caves at Norman Island. There are four caves that you can explore, none of which are particularly deep so you don't even really need a flashlight. They are partly filled with water, so you can swim right in. Unfortunately, no pictures of this since it was pretty wet! The snorkeling outside the caves was also quite good, with plenty of colorful fish all around and interesting coral formations. Next, we headed on to The Indians and Pelican Island, a small island on the way back to Road Town that was supposed to also have some good snorkeling. Unfortunately, the wind was still quite strong, making the water very choppy. Katie and I snorkeled for a bit, but headed in after a while since we got tired of being tossed around by the waves. Finally we made our way back to Road Town and brought Moon Wind back to the dock. I was a bit nervous about docking, but it didn't end up being a problem at all. 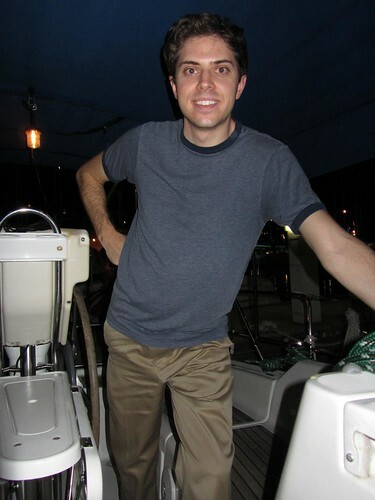 Once we had docked alongside the dock, a fellow from Footloose hopped aboard and helped us get the boat into the slip. It is a good thing he did, since that was a pretty tricky maneuver! 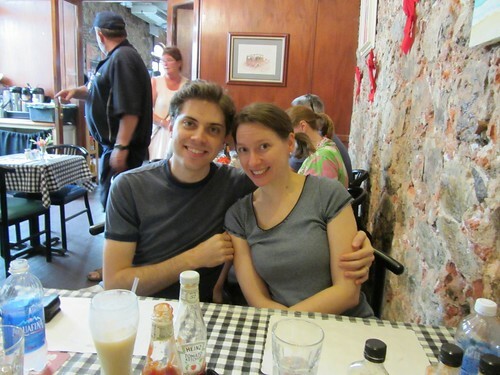 Kellian and I went out for dinner together at a place I had read about named Dove, which got really good reviews. Unfortunately, we didn't think to make a reservation and ended up waiting around for almost 3 hours! Thankfully, the food was quite good! Oddly enough, our waitress at Dove ended up being the same woman who was our waitress at The Last Resort! We recognized each other and chatted for a bit. It is funny how the same person ended up working at both of our favorite restaurants throughout the trip! The following day we packed up our things and headed home. It was an amazing trip and definitely something we'd like to do again! 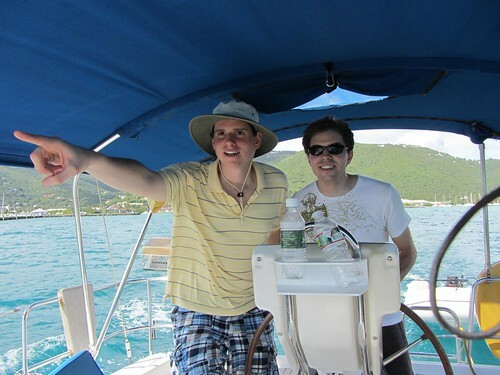 Brian and Kellian, this was a perfect little travelogue, and it sounds like just a perfect trip! How fortunate you are all around - great friends to share the adventure with, great weather and food, each other's lovely company, and the absolutely stunning scenery - all on a great, trusty sailboat. Thanks for sharing - sounds like you had a blast! So happy for you (and ah, no, not jealous in the least!) 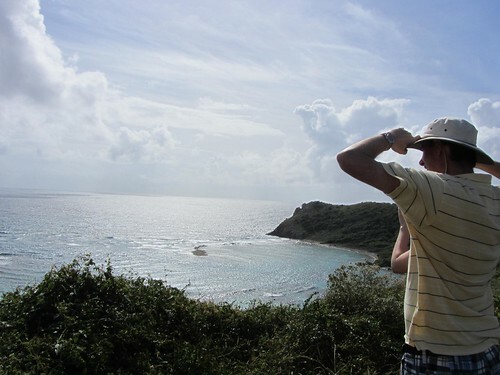 :) We'll see if you have to break out that nice rum soon... supposed to get a tad of snow here... well, it IS January! 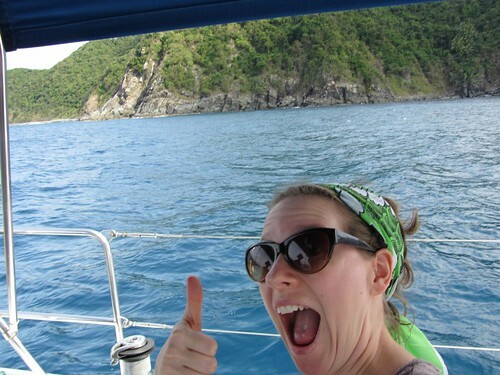 xoxox Auntie M.
Great account on how you conquered the BVI in 7 days! Dayum! That's a one of a kind adventure right there. Props to all of you!